Courtesy of "The 13th Round"
A week removed from a poster controversy in a show dubbed "Mexico v Filipinas" it appears the Mexican promoters have learned their lesson and this time a "Mexico v Filipinas" poster is left a lot simipler with only the "name" Mexican fighter actually featured on the poster. The main fight, which pits the hard hitting David Sanchez (23-2-2, 18) up against Filipino banger Marco Demecillo (19-1-1, 14), has been put together effectively at the last minute afater Sanchez's original foe, Breilor Teran (12-9-1, 5) was forced out of the bout. On paper it's hard to believe that Demecillo is actually replacement opponent and although the call has come late in the day the Filipino should be in great shape given that he has been busy sparring in Japan recently. The fight, which takes place at the Gimnasio del Estado in Hermosillo, is expected to be televised and promises to be an absolute cracker if you can get the chance to see it. Great fight! It's not often that we get posters from "the west" but this week we get one such rarity as Mexican promoter Promociones Del Pueblo bring us a special night of action with a trio of Mexico/Filipino bouts. The fights, as you can see on the poster, will see Nery Saguilan, sporting a cool Lucha Libre mask in the poster, fighting Adones Aguelo, Tomas Rojas, a former world champion, fighting Vergel Nebran and Ramon Garcia Hirales, also a former world champion, battling Lionel Mark Duran. 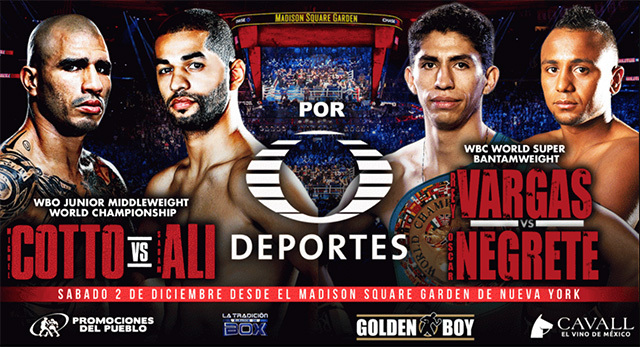 Whilst we're looking forward to this show, which will be televised in Mexico on Televisa Deportes, we are left wondering if the picture of Vergel Nebran is actually Nebran or in fact Milan Melindo. Worryingly Nebran is actually spelled "Nebram" on the poster. Sadly we don't see any of the Filipinos winning here, though we do wish them all good luck.